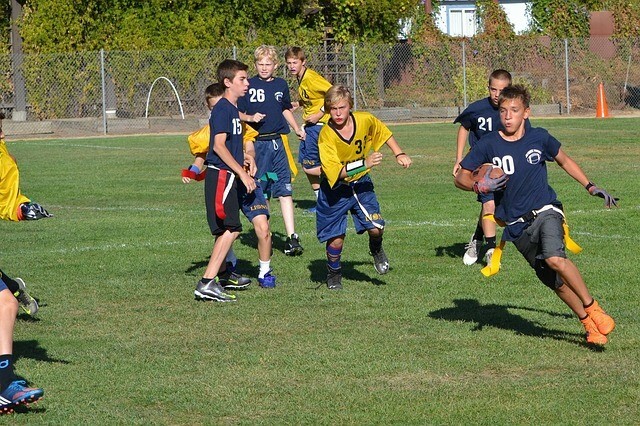 With a few simple rules, you can learn how to play flag football in no time. This popular sport requires little equipment and can be easily adapted for a few players and any size and type of playing area you have available. Perfect for players of all ages and ability levels, these basic flag football rules will help you start your own pickup game. 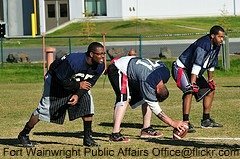 Flag football is played with two teams of 5-8 players who attempt to score points by moving the ball down the field across the goal line. The team with the most points at the end of regulation time is the winner. Typical flag football field dimensions are a rectangle around 60-80 yards long and 20-30 yards wide. There is a goal line at each end leading into a 10-yard end zone. The diagram below shows a standard football field, which can be modified as necessary. To play the game, you need a football and a flag belt for each player. Footballs come in a variety of sizes, colors, and textures so it's easy to find one that fits your group. Flags also come in a variety of colors and styles. Some belts have flags that attach with velcro or plastic fasteners while others have the flags permanently attached so when a flag is pulled the entire belt falls off. A coin is tossed prior to the opening kick-off to determine which team will kick-off first and which goals teams will defend. Teams change ends at half-time. Play begins with a kick-off at the start of each half and after a score. There are no free kicks in flag football; all kicks are done by punting. Players can kick, carry, and throw the ball to move it up the field. A defender may knock down a pass that's in the air. If the player with the ball has his flag pulled or if he goes out of bounds, he is called "down" and the ball is dead at that spot. A down is the period of time that begins when the ball is snapped by the center until the ball becomes dead. When a team has the ball, it has 4 downs to advance the ball 10 yards or score. Each time it moves the ball 10 yards down the field, it's awarded a new set of 4 downs. If it fails to advance 10 yards, the ball is given to the other team at the point it became dead at the end of the 4th down. The line of scrimmage for each team is an imaginary line passing through the end of the football nearest to them, extending from sideline to sideline. The area between these lines, which is the length of the football, is the "neutral zone." No one is allowed to enter the neutral zone or move toward his opponent's goal line at a snap. The offensive team must have at least 4 players on the line of scrimmage when the ball is snapped. The snap is a backward pass through the legs of the center, which puts the ball into play. It must be to a player behind the line of scrimmage, unless it touches the ground. The snap must be one quick and continuous motion, and the snapper can't move his feet or lift a hand until after the ball is snapped. Other players have to stay still until the ball is snapped. Shirts must be tucked in, and they are not allowed to hang down over the flag belt. If a player loses his flag belt legally or illegally during a down and gains possession of a live ball, that player is considered down if they are touched with one hand by a defender between the shoulders and the knees. Players must have the ball before their flag can legally be pulled. It's illegal for a defender to intentionally pull a flag from an offensive player who doesn't have the ball. The infraction is considered a personal foul with a 10-yard penalty. Guarding the flag belt is not allowed. Runners can't use any part of their body or the ball to keep an opponent from pulling their flag. On 4th down, the offensive team is asked if they want to punt from a protected scrimmage. If they do, the defense isn't allowed to penetrate the line of scrimmage on the snap. They can try to block the punt only by jumping straight up in the air on their side of the ball. All members of the punting team, except the punter, must be on the line of scrimmage, and none of them can move until the ball is kicked. If a punt crosses the scrimmage line and touches a player from either team and then hits the ground, the ball is dead and possession goes to the receiving team. A runner can make a backward pass at any time. A teammate may catch the pass or recover it if it hits the ground. If the ball is caught or intercepted by any player inbounds before it hits the ground, it can be advanced up the field. If a player loses the ball and it leaves his hands, play continues no matter which team recovers it and whether or not it touches the ground. The offensive team is allowed one forward pass during each play from the line of scrimmage, but the passer must be behind the line of scrimmage when releasing the ball. Any other forward pass is illegal. If a player is in the air while attempting to catch a ball, he must land with at least one foot in bounds when he has possession of the ball before going out of bounds, unless contact by the opposing team is what causes him to go out of bounds. If players from opposing teams catch the ball at the same time, the ball is given to the team that snapped the ball. When a player carries the ball into the opponent's end zone or catches a pass while in the end zone. After a team scores a touchdown, they get the opportunity to earn extra points by placing the ball on either the 3, 10, or 20-yard line, lining up for scrimmage, and getting it into the end zone again either by a run or pass. A safety is called when an offensive player is tackled with the ball in his own end zone. When this happens the defensive team is awarded 2 points, and the team that was scored on has to kick off from their 14-yard line. If the defensive team gains possession of the ball during an extra point attempt and carries or passes the ball across their goal line, they receive 3 points. 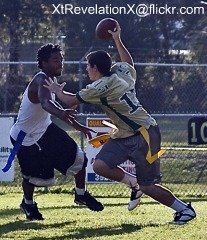 How to Play Flag Football continued... Follow the link for rules about game length, fouls and penalties, dead balls, out of play situations, and modifications to make the game accessible for everyone. 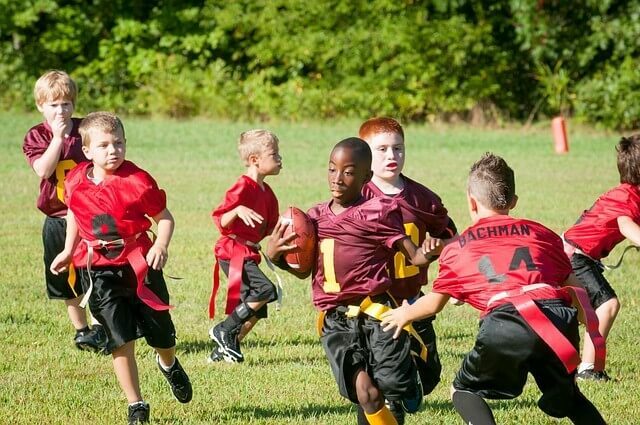 Check out NFL Flag to learn about opportunities for kids ages 5-17 to participate in an flag football program sponsored by the NFL and USA Football.